Hi, I did a little searching and turned up one thread from back in 2012, wasn't sure whether that was still applicable or not, but basically, I'm wanting to import a couple address books, but I need to build some sort of a blacklist or manual unsubscribe list as there is some overlap from each one of these imports that I do not want to include on the mailings. I understand the best thing to do is to delete them, but then in another few months when I want to re-import the address book as an update, I have to go through and delete all those same addresses again. That would be a pretty painful process. 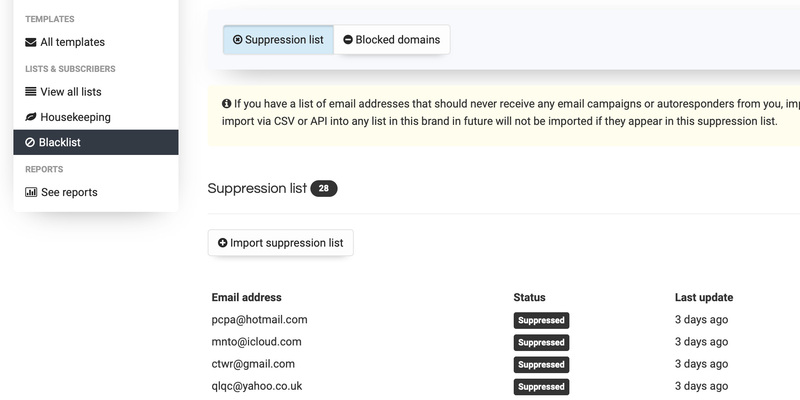 Create a list and import all your subscribers inside (those you want to blacklist). Note: 'the_list_id' is the id of the list you previously imported your subscribers into. The list's id can be found in the lists table. The whole list will be blacklisted throughout the application. No emails can be imported if they match any one of the email address inside that list. No future emails can be sent to these 'bounced' emails no matter which list or brand they appear in.